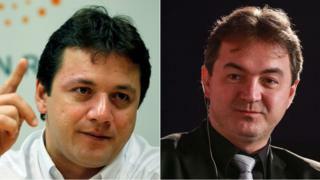 A federal court in Brazil has confirmed that brothers Joesley and Wesley Batista, who are the controlling shareholders in Brazil's largest meatpacking firm JBS, will face trial for alleged insider trading. They are accused of selling JBS shares at top prices in the weeks before revealing damaging information about their company's bribery scheme. Their revelations caused stocks to plummet. Both are already in detention. Prosecutors say the two tycoons saved $44m (£33m) by selling the shares before entering into a plea deal with investigators. As part of their plea bargain, they revealed information about how they bribed high-ranking officials, fully knowing that the revelations would cause their company's shares to tumble. The day following the Batista brothers' revelations, the firm's stock plunged more than 10% at the start of trading. The fall was so drastic that share trading on the Brazilian stock market was briefly suspended. The most explosive material Joesley Batista produced was a secret recording he had made of President Michel Temer, in which the president apparently admitted paying hush money to an influential politician. President Temer faced impeachment proceedings over Mr Batista's allegations. But a majority of lawmakers in the lower house of Congress voted in August against a proposal to suspend him and allow him to be tried by the Supreme Court for corruption. While the plea deal offered them immunity from prosecution on corruption charges, Joesley and Wesley Batista were arrested in September for alleged insider trading.